Pre-purchase for immediate access to an exclusive mount, the base game, Summerset & Morrowind Chapters, and the Morrowind & Summerset Collector's Packs (digital pre-purchases only) in addition to bonus in-game content available at launch. Enhance your adventures with these exclusive bonuses. Rahd-m'Athra HorseWhen the dro-m'Athra ride from the Dark Behind the World, they go mounted on these dread steeds: the Rahd-m'Athra! Instant access with digital pre-purchase. Blue Dragon ImpA clever Illusion Imp that's found a way to get free handouts and a warm place to sleep. Baandari Pedlar Crate (x1)A mystery collection of Baandari items! Noble Clan-Chief CostumeThe clans of Anequina in northern Elsweyr are largely nomadic, but they nonetheless have hereditary aristocracies who express their wealth and power through the splendor of their clothing. Experience Scrolls & Treasure MapsA collection of two Crown Experience Scrolls and three Elsweyr Treasure Maps to help you get started in your adventures. Exclusive Mount: Senche-RahtLargest of all the furstocks, or "breeds" of Khajiit, the Senche-raht is fully intelligent, and in combat often serves simultaneously as warrior and mount. Exclusive Pet: Ashen Scar JerboaThere are many in the Ashen Scar, and if you catch one when it's small, it makes for a pleasant, fuzzy friend. Emote Pack: Khajiiti Cultural PackCat-Folk Pack that includes the emotes Cat Contemplation, Feline Hygiene, and Pedlar Beckoning. Exclusive Outfit Style Conversions: DragonboneAllows you to convert your gear to the Dragonbone style. Exclusive Memento: Archaic Lore TabletsInvoke these Tablets of Archaic Lore and they glow with the wisdom of ancient knowledge! Summerset Chapter Collector's EditionExperience an epic adventure set in the home of the High Elves. Includes instant access to Summerset Chapter and Collector's Edition digital items. Morrowind Chapter Collector's EditionExplore the island of Vvardenfell, harness nature-based magic as the Warden class, and more! 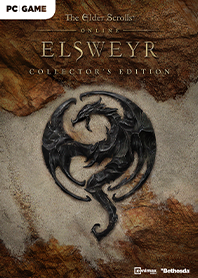 Includes instant access to Morrowind Chapter and Collector's Edition digital items. 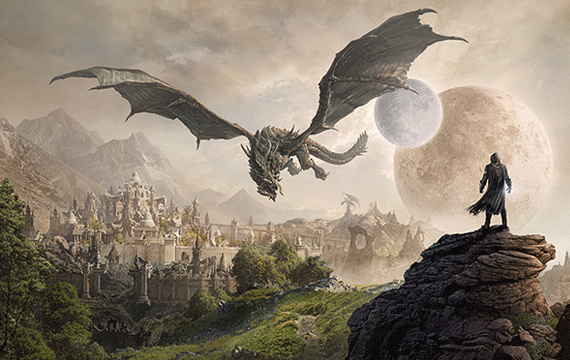 VENTURE TO ELSWEYR -- Explore the Khajiit homeland; a land ravaged by warfare. DEFEND AGAINST DRAGONS -- Scaled terror attacks from the skies! Seek new allies and weapons to take them down. A YEAR-LONG EPIC TALE -- ESO reaches new storytelling heights with an epic tale told across a Chapter and three DLC game packs. WIELD THE POWER OF NECROMANCY -- Master control over life and death with a character class that channels the undead. INCLUDED CONTENT – Gain instant access to the ESO base game as well as Morrowind and Summerset Chapters.